Suggested Citation: Kerr, Andy. 2000. Oregon Desert Guide: 70 Hikes. Seattle: The Mountaineers Books. p. 172. The ecoregion has been greatly affected by water, though it doesn't have much now The great floods of the Columbia River, the wind-blown sand and silt from the river (loess), and the carving action of the Deschutes, John Day, and other streams that created basalt canyons surrounded by lava plateau—all are water's work. Winters are cold and summers hot. Most of the ecoregion gets less than 15 inches of precipitation annually. In many areas, it is less than 8 inches, mostly falling as snow. According to the Oregon Biodiversity Project, several unique habitats exist: dunes along the Columbia, oak woodlands near the Cascades ecoregion, and mounded prairie. 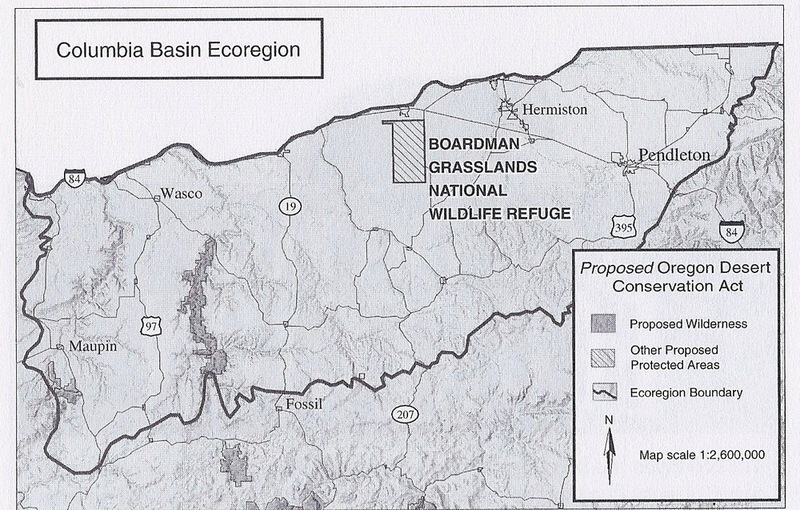 Much of the wetlands have been lost to Columbia River reservoirs. The best potential lands for conservation and restoration are associated with the military-industrial (as opposed to the agriculture-industrial) complex. A corridor of high-quality bunchgrass and steppe exists along the reservoirs because it is Umatilla Army Depot land. Navy bombing of their Boardman range had less ecological impact than cow bombing. In 1962, Oregon leased—until 2032—tens of thousands of acres of state lands to Boeing to develop a spaceport. While Boeing has subleased much for agriculture, much remains in good condition (last Oregon holdout for the Washington ground squirrel).